We can help advisors find the truth behind the numbers. This is the atypical case of a company trading as ‘We Buy Any Car’ that lost no less than $9,848,090 in 12 months. This incredible company debt equates to an average loss of over $175,000 for every week of trade. The company directors, appointed Worrells as liquidator under a creditors’ voluntary winding up in July 2012. And one of the two directors promptly left the country. Trade creditors, staff, and vehicle sellers unwittingly contributed over $5 million of company debt. Seven hundred and one creditors lodged a proof of debt in the winding up. A handful of creditors even took matters into their own hands when they tried to take back the vehicle they sold. The fallout and the lengthy and in-depth investigations that ensued from this company’s liquidation to find the truth behind the numbers, could supersede the length of this Guide you’re reading, so we offer this Case Study as a snapshot of what went wrong. Most businesses start with limited working capital—this company was flooded with $6 million, interest-free, without security, and without requiring any business performance reporting. Most businesses gradually increase turnover over many years—this company was trading high volumes within the first six months of opening. New business owners can be inexperienced or need more technical knowledge—one director had 35 years’ experience in the industry, was previously a director for a company with a turnover of $90 million plus annually. Most directors that enter a partnership, know each well and are convinced of business compatibility—the two directors were all but strangers. For most businesses, each sale adds to its profits or reduces it losses—each sale consistently increased losses. While many businesses fail due to a lack of budgeting or adequate bookkeeping, nevertheless, most at least, make a reasonable attempt at these business elements—planning was non-existent and its accounting totally useless. The directors never had the slightest idea of the business’s financially position. Have these observations got your attention? It certainly evoked a relentless search of the truth in the years that followed. We understand that the intention was for this business to follow a successful example of a similar operation in the United Kingdom (see: webuyanycar.com). Despite the company extensively using and promoting the name “We Buy Any Car”, at no time was that name owned or registered or any party connected with the company. Under the ‘We Buy Any Car’ value proposition, people could sell their car to the company, for an agreed price (based on red book value and personnel discretion), and be paid within 10 days—regardless of whether the car was resold or not. We Buy Any Car then on-sold these vehicles through an auction house. The business marketing hinged off extensive television, internet, and other media advertising to encourage people to sell their vehicle to ‘We Buy Any Car’. We found that it spent around $5.5 million on this marketing, which across the 7,300 vehicles purchased equates to over $758 per vehicle. Given this business model was unique in Australia, there are no industry statistics to compare this expenditure with. The investment in marketing so was so great that when the advertising agency tried to collect its debt— $952,000 (described as “extraordinarily large” by the agency’s director)—it was a principle catalyst in the We Buy Any Car directors resolving to wind up the company. The company was substantially funded by a series of large, interest-free and unsecured advances by one of the directors (through his separate company). The company’s claim over a loan account of $6,064,839 was admitted into the winding up. Company shares were issued at $1.00 each. That is, the company only ever had funds of $200 of its own, and therefore relied entirely upon loans and credit from trade suppliers, and credit from those selling cars to the company, for its working capital. Minor income was also received from related trading activities such as finance commissions. Cash flow was maintained through one main trade creditor: an auction house that advanced payments equal to 90 percent of each vehicle’s value sent to auction. A $150 fixed fee was charged per vehicle being auctioned plus transport and detailing disbursements. As an aside, the auction house offered a reduced auction cost if a certain number of cars were sold, which was never reached due to the winding up. Given the nature of buying and then on selling vehicles, a “back to back” purchase and sale (self-funding) was intended. Some 7,300 vehicles were traded over its 12-month business, which equates to an average of 150 per week. So, let’s crunch the numbers, hypothetically, as no records reflect the principle underpinning the We Buy Any Car business model. While substantial expenses were incurred to reconstruct the accounts, we identified significant recoverable assets to meet administration costs and submitted an extensive report to ASIC concerning the company affairs (section 533 of Corporations Act 2001). That unsecured creditors were owed no less than $11,507,436 (being $6,064,839 loan account debt and $5,442,597 due to other creditors). Of the 629 We Buy Any Car vendors (customers) that were not paid for their vehicles, 93% sold their vehicle in the last two months of trade. Their claims totalled $2,624,844, which averages at $4,173 per customer. 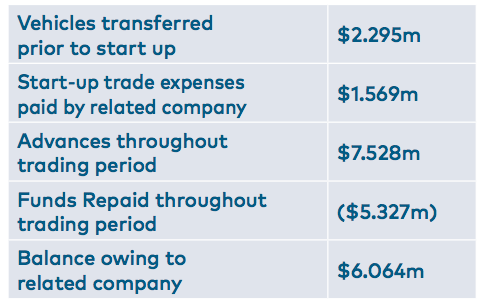 Over $1.7 million was spent on information technology and website development; however, no element was saleable or could otherwise contribute to the return due to creditors. Over $120,000 was lost in duplicate payments over 41 vehicles. 22 vehicle vendors were overpaid to the extent of over $58,000. Records show the directors had been negotiating with a potential investor who, after conducting their due diligence, withdrew their interest. We established an insolvent trading claim of $4.9m. We held a public examination of the two directors, some employees, the ex-bookkeeper, and some creditors. The director that absconded the country prior to the winding up attended the public examination via video link from the UK, said he intended to return to Australia but stayed due to threats he said he received and because of what he described as “the media circus”. He stated at the public examination that he had “no access to administration or accounts” and further that he “was just solely focused on the sales”. To sustain cash flow and the ‘back to back’ self-funding premise, the advances made for potential auction sales were held as an undertaking and subsequently registered as a security by the auction house’s financial associates. Shortly prior to our appointment, this auction house retained the latest vehicle sale proceeds (balance from an advance). The legal advice we obtained said that it was likely a court would find their security invalid—lodged 25 days before our appointment—and that as an unfair preference payment a court would order the $1,035,712 retained under its security be distributed back to us as the liquidators. We commenced litigation to seek full recovery of the $1,035,712. In view of the argued defences lodged, we reached a settlement of $400,000, which was a commercial decision that avoided potentially lengthy and expensive court action. Our investigations determined that We Buy Any Car was either insolvent from inception due to inadequate financial records kept as required under section 286(1) of the Corporations Act and alternatively as at April 2012 under section 95A. We sued the non-absconding director for the $4.9m insolvent trading claim, which he vigorously defended (at substantial expenses to him). A court-ordered mediation was unsuccessful, and on the eve of a lengthy trial we finally agreed to a settlement amount of $600,000. Given we held no funds in the liquidation and none of the corporate creditors were prepared to fund litigation, our legal counsel advised that commercially it was in the administration’s best interest to accept the settlement offer on the terms that this director (and his respective companies) subordinate their $6,213,740 claim behind the other creditors in the liquidation. We pursued the other director (who absconded the country) with a demand and were unable to locate any significant assets (in the UK or elsewhere). Again, any further expenses would need to be in the creditors’ best interest, which rendered further action uncommercial. Again, our reports to creditors and our confidential report (section 533 Corporations Act) submitted to ASIC supersede the length of this Guide to Insolvency, so we outline our main reasons for why this company failed. The directors did not act cohesively for the greater part of the company’s trading life and individually, they had an extremely limited understanding of the company’s actual trading profile, the worth of its assets and the value of its liabilities. At no time, did the directors possess meaningful accounting or management reports, or indeed that the accounting records could produce such reports. Lack of business control led to vehicles being bought and sold with less than adequate margin and incurred of certain costs at unsustainable levels. Overall only a limited gross margin was achieved and that extensive marketing and other administration costs were incurred leading to losses being recorded. Many dealers were slow to pay for vehicles supplied, which hindered the ‘back-to-back funding’ model. The marketing campaign was so successful that nine months into 12 months of trade, insufficient vehicle wholesalers were willing and able to purchase the number of vehicles being sourced. This liquidation was certainly confounding and challenged us, as insolvency practitioners, of just how directors and key personnel could be willingly enabled to ‘drive blind’—not just initially when the business started up, but consistently over its 12-month life. Individually and collectively, the directors and employee’s sustained efforts to build this business, actively and ignorantly contributed to a weekly loss, on average, of over $175,000 that accumulated to a net loss of $9,848,090 in just 12 months. 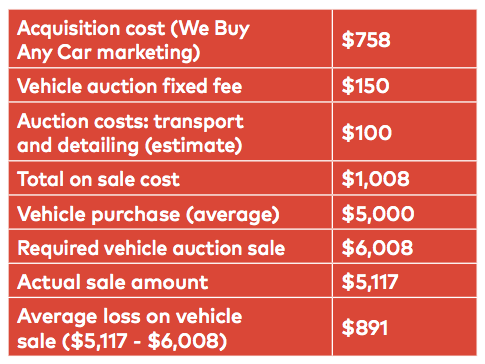 Each sale of the 7,300 vehicles We Buy Any Car sold: consistently increased losses. Particularly, when the directors had expert knowledge about cars and was steeped in motor vehicle trading. And one director had a 35-year career in the industry and was previously a director for a company with a turnover of $90 million plus annually. It seems somewhat fitting that the very thing that underpinned its illusion of success was the business marketing, which that forced the directors to end the collateral damage and resolve to wind up the company when the advertising agency demanded payment of their $952,000 account. It seems that proverb “things aren’t always what they seem” is apt to discern the illusion from the reality of this business. Whether a business is in the start-up phase, or in the decline phase, Worrells can offer our understanding and experience from various business models, structures, and industries to help advisors find the truth behind the numbers.